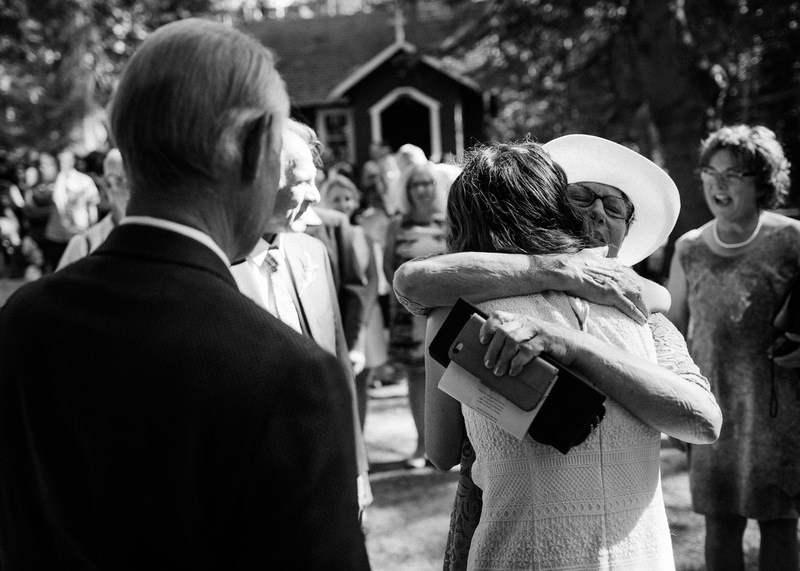 Lydia & Michael’s wedding on Pender Island is easily one of my favourites I’ve ever been a part of. Their ceremony officiated by Penny Allport was beautiful, marked by the ringing of a meditation bell, the passing of the rings through the hands of all the guests present and then capped off by the bride and groom entering the church alone together to ring the church bell. It was deeply moving, unique and a perfect representation of these two kind and warm people. After the ceremony the three of us went for a walk through Brooks Point Regional Park to take some portraits and Lydia asked me if I thought I would ever get married. I said after witnessing your ceremony, ya I think I would. It was the type of wedding that really makes you believe in love. ﻿My family has a long history with Pender island where we held our wedding. Holding it there ensured that family would be a main theme, with my aunt growing flowers for the wedding in her garden, and sewing tables cloths for the reception, much like I imagine weddings of past generations to have been like. Our ceremony was held at the tiny heritage church down the street from my parents house. Michael went for an ocean dip just before the ceremony, something only an island wedding allows for. The smell of the cedar trees and the dappled sunlight perfected the intimacy and sacredness of the ceremony. We rang the church bell together to mark the occasion of our marriage. Our wedding was simple, but rich for the senses. We served beautiful Indian food, with all the ingredients grown on Vancouver Island, a handmade cake by one of our friends, and had a Motown themed playlist that all generations enjoyed dancing late into the night together to. We are so grateful to have had a wedding that felt natural, intimate, and joyful, celebrating our love, alongside the love we have for our friends and family. The day was so beautifully captured in Scott's photos, and we are so lucky to have them as a keepsake. Scott Little is a wedding photographer based in Vancouver, BC, Canada. He specializes in capturing compelling candid’s and artistic portraits of his couples and their guests with his blend of documentary, fine art and photo journalistic approaches. This results in very natural, emotional and honest wedding photography that his couples and their families will cherish for years to come. Servicing Vancouver and the surrounding area - but available for travel worldwide.